Camera Basics 101: Learning The Ropes! Did Santa bring you a camera for Christmas? Have you always wanted to get the basics down of what all those buttons and dials do? This workshop will have you going from "ugh" to "ahh" in no time! 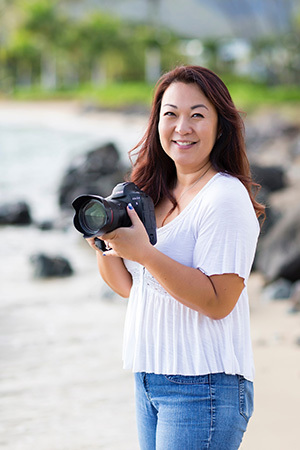 Join our Community Creative, Darcy Fiero, as she goes over the steps to make your camera feel as comfortable in your hands as your mobile device. Identify your style of shooting and learn to set up your camera's specific functions to make it most useful. Learn the basics of good camera maintenance and how to properly care for your gear to ensure years of use. Understand the creative modes of your camera and best practices on when and how to use them. Learn about camera accessories that may enhance your photography skills. Please be sure to bring your camera with you to this workshop so you can follow along. You can also rent a camera from our shop if you're looking to buy something new and want to figure out how it works first. Splitting her time between the Hawaiian Islands of Oahu and Hawaii, Darcy Fiero can usually be found at sunset where the Pacific Ocean meets the reef or in the rolling hills of the Big Island where the pueo gather and soar. When asked what she enjoys shooting the most, she quickly answers with an all-encompassing, "Mother Nature." Everything from the awe-inspiring heavens to the many splendors of the land to the wondrous cerulean blue of the sea, nothing is off limits to her. With her unique vision, Darcy constantly strives to create a work that invites the viewer in and compels them to linger, study, and truly feel that one captured moment.